If you are like me, you might have felt the frustrations of wondering why your Instagram feed isn’t growing at the rate you would like it to. You have great content, your images are clear, you tell a consistent story and you make sure to tag places and use the right hashtags. What many people fail to realize is the amount of effort that it takes to engage with your audience. Posting is not enough anymore and you have to actually interact with your audience on a daily basis. What is engagement? 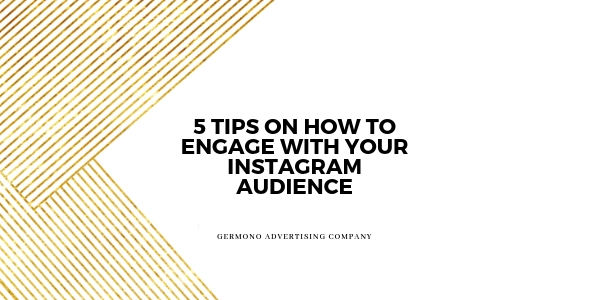 Engagement = likes, comments and views and here is how you can start to make that happen! You can find other bloggers who share your interests or other businesses in your area and connect. Get about 15 accounts together and create your own direct message group. Each time you post, you can let the group know so they can go to your page to comment/like and you do the same in return for them. This can help break through the new instagram algorithm that keeps you invisible. Giving and receiving regular, consistent comments gains you more visibility. It might seem a little artificial but in order to grow, it helps to have a little help from your friends. 2. Let people get to know you and/or your team. We are all human and we love to be able to connect with other humans so every once in a while, take a moment to let your audience see that side. You still want to the post the things that are important to your business, but it is 100% okay to let people in from time to time. 3. Try posting a quote. There are two ways to utilize videos on instagram. You can now post up to 60 seconds of footage to your feed and these videos pop up first when people search. Also, use the instastory feature from time to time. It can be quick shots of what you are working on or a quick video of how your day has been going. The more creative, the better and these videos also populate first in the search field. Utilize this as a tool to help expand your reach. This is probably the most common and widely used method to help with engagement. When creating a giveaway try to incorporate another business, blogger, or influencer along with you. This will help cut down on potential costs on your end, while exposing you to twice or triple the amount of people. Most contest entries make sure that followers like their page and tag a few friends in order to enter. Be sure to adhere to Instagram’s rules for promotions, giveaways, and contests! Easy right?! If this all seems a little overwhelming, just try implementing 2 of these methods to get started. Remember, you are not alone in your instagram struggles! Don’t be afraid to try new things because eventually you will find something that sticks.